1. Preheat a fan-forced oven to 190°C and line a 30x10cm baking tray with baking paper. 2. Crack eggs into a large mixing bowl, add milk and cream, then whisk to scramble. 3. Add McCain Peas, tasty cheese, Danish feta and flour to egg mix and mix well to combine. 4. Scatter McCain Diced Pumpkin in the lined baking tray and top with egg mixture. Dot with halved cherry tomatoes and bake for 55 minutes or until set and firm to touch. 5. Remove from oven and allow to cool in tray completely. Cut into bars and pop into lunch boxes. 1 Preheat a fan-forced oven to 190°C and line a 30x10cm baking tray with baking paper. 2 Crack eggs into a large mixing bowl, add milk and cream, then whisk to scramble. 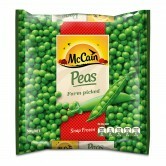 3 Add McCain Peas, tasty cheese, Danish feta and flour to egg mix and mix well to combine. 4 Scatter McCain Diced Pumpkin in the lined baking tray and top with egg mixture. Dot with halved cherry tomatoes and bake for 55 minutes or until set and firm to touch. 5 Remove from oven and allow to cool in tray completely. 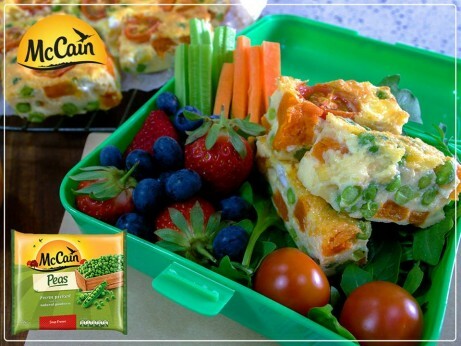 Cut into bars and pop into lunch boxes.